NEW YORK — This was an uncharted territory for Vasiliy Lomachenko. The look on his face? One of surprise. Embarrassment, even. Through 11 professional fights, Lomachenko was a tour de force, save for his second pro bout, when he brazenly challenged grizzled vet Orlando Salido for a title and was barely outpointed. He picked up the moniker “No-Mas-Chenko” along the way. 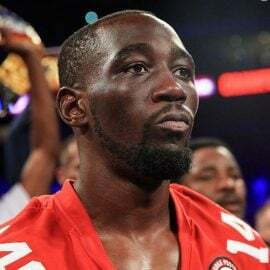 After all, the two-time Olympic gold medalist had stopped four consecutive fighters before he met Jorge Linares on Saturday at Madison Square Garden in the ESPN main event. And now, Lomachenko (11-1, 9 knockouts) found himself on the seat of his pants, the result of a pinpoint Linares right hand in Round 6. For the first time in his illustrious career, Lomachenko was knocked down. But he didn’t stay down. Of course he didn’t. He collected himself, even if his pride was wounded, and soldiered on. Slowly but surely, Lomachenko regained his momentum with his excellent, head-bobbing pressure that confounded Linares all night. 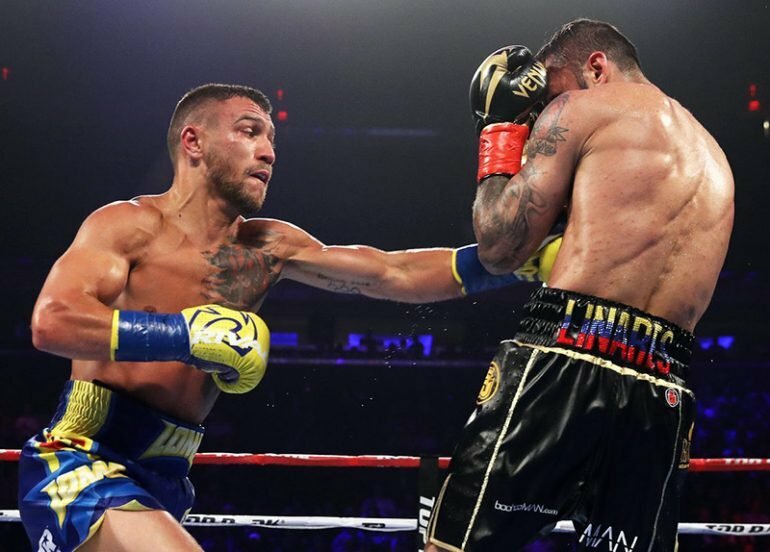 And finally, in Round 10, Lomachenko connected with a bevy of shots, delivered in dizzying fashion, and when the left hand dug into Linares’ solar plexus, it was a wrap. 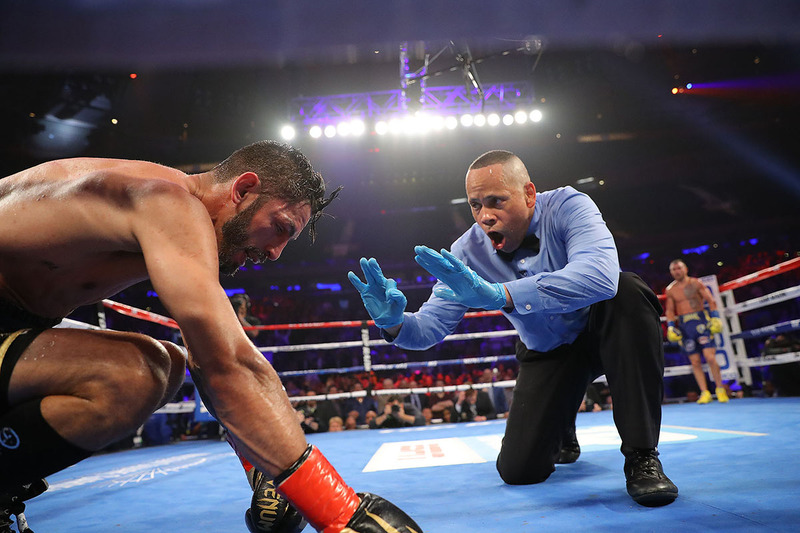 Linares (44-4, 27 KOs) beat referee Ricky Gonzalez’s 10 count, but he couldn’t even stand erect, let alone fight anymore. Gonzalez waved it off at 2:08 of the frame, and Lomachenko picked up perhaps the most impressive victory of his career. He was met with true adversity for the first time since he lost to Salido, and this time, he prospered. With the victory, Lomachenko picked up Linares’ RING/WBA lightweight championship, and shattered the record for fewest fights needed to claim titles in three weight divisions. And that left hand to the body from Lomachenko to just good — it might have been necessary to pull out the fight. Linares was up 86-85 on one scorecard, Lomachenko was ahead by the same score on another card, and a third judge had the fight even, 85-85, at the time of the stoppage. Early on, it didn’t appear Lomachenko would be forced to create any dramatics to win the action-packed fight. The 30-year-old who trains out of Oxnard, California, was beating Linares to the punch, and he was able to let loose with four- and five-punch combinations time and again. When Linares sought to use his significant size advantage on the inside (152 pounds on fight night to Lomachenko’s 138), the wunderkind simply slid over to his right to create some distance and escape harm’s way. Well, Lomachenko made it look simple anyway. He’s always made it look easy in the ring. Like when he absolutely outclassed Guillermo Rigondeaux in December and forced the pound-for-pound entrant to quit on his stool. Or when Lomachenko coaxed Nicholas Walters into submission. But as the fight wore on, nothing really seemed easy about this outing. Finally, Lomachenko met a counterpart who could almost match him in the speed department, and a fighter in Linares who was by far the biggest opponent he’d ever stepped into the ring with. But for every two or three shots Lomachenko appeared to land flush, Linares connected on one shot, and a grazing one at that. He simply couldn’t find the proper distance. Lomachenko wisely maneuvered in front of Linares at mid-range; close enough where Linares couldn’t utilize his superior range, but not so much that Linares could impose his superior strength. 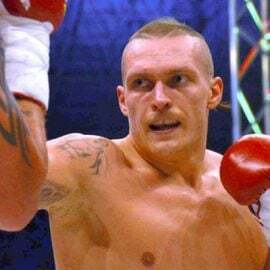 The fighter who claimed titles at 126 pounds and 130 employed light touching to open up the Linares guard before he peppered with lightning quick shots. The Venezuelan was clearly frustrated, and he began to load up on desperation right hands, hoping one would finish matters. 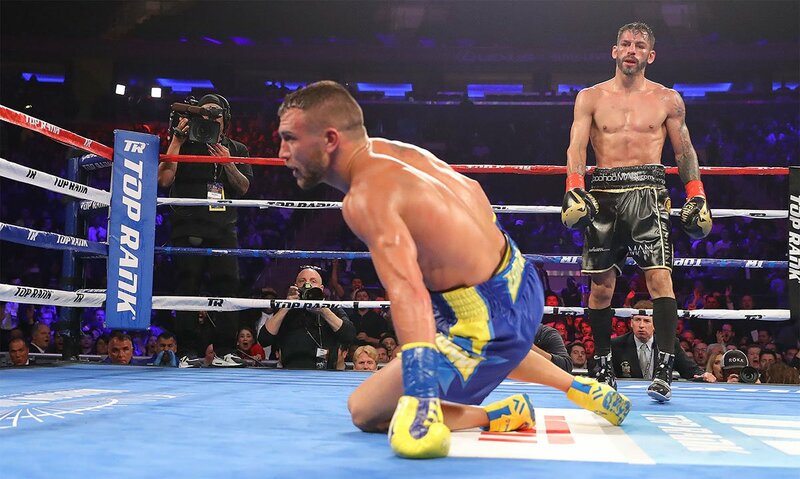 When he stepped back and connected on that straight right hand that floored Lomachenko, it appeared Linares had him in real trouble. But there were only a few ticks remaining in the sixth round. Lomachenko was able to collect himself when Round 7 rolled around, and Linares’ moment to capitalize vanished. Linares might have wanted to continue, but he appeared spent, and he lives to fight another day. It’s a moral victory for the Golden Boy Promotions fighter, who looked shaky in two lightweight title defense victories entering the bout, and was counted as a heavy underdog to turn back the challenge of Lomachenko. If anything, Linares’ stock improved in defeat, but his lightweight championship is now gone, and so is his 13-fight winning streak. It’s Lomachenko who plows forward to even greater events as his star continues to grow. 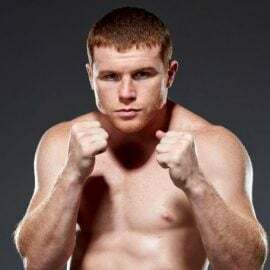 He’ll return August 25 at The Forum in Inglewood, California, on ESPN, his hall of fame promoter, Top Rank CEO Bob Arum, told reporters. The expectation is that Loma will face WBO titleholder Ray Beltran in a lightweight title unification fight. 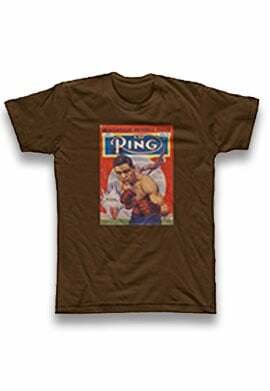 Lomachenko is THE RING’s No. 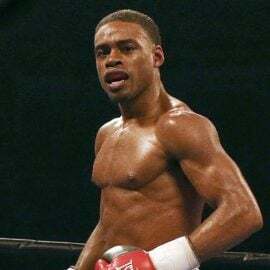 3 pound-for-pound fighter, but he appears to have no peer in boxing. 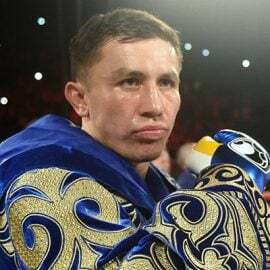 It’s going to take a truly special fighter to top Lomachenko now that he’s smack-dab in his athletic prime, no longer the green fighter relying on a great amateur career and tremendous athleticism. Is it Mikey Garcia? Or will Lomachenko have to push himself to an even higher weight class to meet a fighter who can beat him? 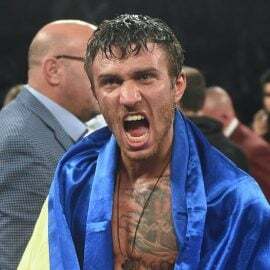 It’s said that you never know how truly great a fighter is until he meets adversity, and now we know for sure: Lomachenko is one of the special ones.